It was a Saturday morning. My schedule? Assignments, assignments, and OH YEAH – more assignments. It was not in the plan to even leave the house. So, I made a split-second decision. So, I put on my hiking gear and I packed a bag, locked the door behind me, and off I went on my adventure. And an adventure it was. You see, I don’t own a car. That’s because I live in Melbourne and the public transport here is pretty good. That is, if you’re just travelling within the city. Where I was headed – the Dandenong Ranges – was practically the country-side. SPOILER ALERT: I made it. Lol. The 19 tram from Brunswick Road/Sydney Road to Melbourne Central Station. The Lilydale Train line to Croydon (21 stops). The 688 Bus to ‘Upper Fern Tree Valley’ from Stop 6 outside Croydon station (which was actually super easy to find), then getting off after 37 stops. Thirty Seven! At Dandenong Tourist Road/Falls Road. Make sure to look up the latest routes on Public Transport Victoria, or download the PTV app. I arrived! With total travel time at 2hrs 11minutes. The above photograph is outside the carpark – the track to the falls is off to the left. There’s a lovely little picnic area here, as well as plenty of signage to help you on your way. I forgot to get a photograph of the map because a group of tourists were milling around it when I arrived, so I figured I’d get the shot on the way back. Of course, I forgot. Sorry everyone. There’s also toilet facilities, which aren’t drop toilets but are still pretty dismal, and which only had freezing cold tap water. The track to the falls is quick (roughly 300m), and all downhill. Off I went, through an array of gorgeous Karri trees. There are also a number of other walking tracks in this area for those that are keen hikers. Me? I’ll only hike if it will find me a waterfall. But if you want more information on the hikes in area, you can click here. Then I reached the fork in the road with the track to the Lower Falls one way and the Upper Falls the other. You’d think my heart would’ve sunk at the sight of the fence blocking off the Lower Falls track, wouldn’t you? In actual fact, I didn’t even bat an eyelid. I knew full well I’d be going down there regardless. I didn’t come all this way for nothing. But I decided to check out the Upper Falls first. On the short walk to the Upper Falls, a little path had formed itself down the river bank. I knew I’d be scooting on down there, too. However, a little further along there’s a viewing platform, from which you can get some pretty gorgeous shots, too. Still, typical me found my way as close to the water as humanely possible. I can imagine that in the crux of winter, it would be impossible to walk across the rocks like I did. At this time (May on the cusp of June) it was relatively tame. I spent quite a bit of time meandering across the rocks to get some shots at different angles. It was a very peaceful day, with not too many people around, so I wasn’t disrupting anyones photographs. There was a steep descent ahead of me, and I felt my heart clanging around in my chest. What challenge awaited me? Why had the path been blocked off? I was about to find out. It was a bit anti-climatic, really. I thought I was going to have to scramble over huge fallen trees and debris and stuff. Turns out it was just the side railing that had been destroyed. The path itself was fine. I know, boring right? Tis’ pretty hectic damage, though. But I continued on just fine without the aid of the railing. I guess if it had been a wet, rainy day it would’ve been more dangerous. Travel at your own risk, I guess. Before long I came to a fork in the road – which was actually three seperate paths, marked with a wooden stool, a big tree and more hand-railing. I decided to veer right first, in an attempt to get closer to the Upper Falls. I had peered down at them from the top viewing platform, aching to go further down and get better angles for photos. I hoped this path would lead me there. Success! I managed to find the endless cascades of the Upper Falls, and a thin path along the right of the river bank made it easy to walk along and get closer. As you can imagine, with heavy rainfall in the midst of winter this may not be accessible. It kind of reminded me of The Lion King 2, when the river suddenly gushes and fills with water, covering everything in its path. But luckily for me, my fate was less drastic than Zira’s. If you don’t know what I’m talking about, you need to go and watch The Lion King 2 right now. Like seriously, quit reading this and go watch it. Anyway, then I ventured back to the fork in the road (where the wooden seat was) and tackled the path that wasn’t really a path, slipping and sliding my way down (literally, this was dangerous so be very careful if you plan on doing this). The difficulty was rewarding, however, when I reached some mini-falls. These were probably my favourite along the entire bank. Now, because I still haven’t invested in a tripod (give me a break – I’m a broke uni student! ), I had to rest my camera precariously on slippery rocks. It actually almost slid off once, but I caught it. Thankfully. The mini heart-attack I had when that happened was enough for me to give up on the photographs. However, before that little incident, I managed to capture some shots on self-timer. I look pretty relaxed, hey? Haha don’t be fooled – my camera’s self-timer only allows up to 10 seconds of delayed photography, so I had to sprint (on slippery mud) and leap over the rock on the right-hand side – yeah, the one covered in the green moss – in order to get to that spot. And there I am wearing my Lu Lu Lemon Top which makes me look like I have horrendous back-fat. But IT’S FINE. I GOT THE PHOTO. Anyway this was the last shot I took before I almost lost my camera down the stream of freezing water, so I made my way back up to the main path. P.S. If anyone wants to be my hiking/waterfall buddy and take aesthetic photos of me, don’t be shy! Enquire within. I then started the short journey to the Lower Falls along a thin, muddy path. All in all, the difficulty rating of this track is relatively easy. I continued on, down a windy section of the path that veered around to the right and opened up into the Lower Falls platform. It was peaceful, seeing as the path was blocked off, and I had the place to myself. As you can see, the falls keep going further downstream. I wondered what they look like from here on. But the access ends here, so I will never know. Luckily, the Lower Falls were beautiful and distracted me. I rested my camera on the ledge of the platform to achieve these shots (don’t worry, this time I kept the strap around my neck and didn’t abandon the camera, so there was no chance of it falling to a cold, wet death). Again, further up there were some more mini-falls. I simply loved experimenting with photos, and taking in all the beautiful surroundings and the different nooks and crannies of this waterfall. I really am surprised they don’t refer to them as cascades. Overloading you with photographs just to try and spark some inspiration in you. I highly recommend going to visit! 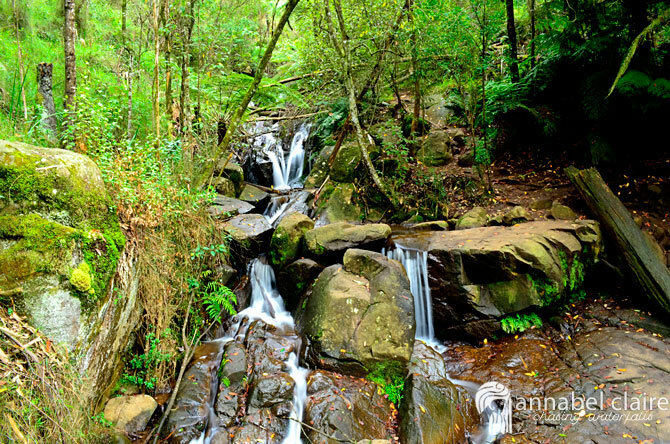 Plus the Dandenong Ranges itself is a beautiful area of Victoria. I felt the air turn chilly and crisp the moment I arrived. But it was amazing – clean, fresh air free from all the city’s pollution. I was relieved to be free of cigarette smoke, if even for a little bit.